For months, the Standing Rock Sioux Tribe in North Dakota has been protesting the construction of a $3.8 billion oil pipeline that would cut through four US states. By early September, the protests reached unprecedented size, as hundreds of environmental activists joined the local community of about 8,000. This is the largest gathering of Native Americans in over a century, with over 90 tribes represented at Cannon Ball, North Dakota, just south of Bismarck, the state capital. The Native tribes and environmentalists say the pipeline would disrupt a sacred burial ground, as well as threaten water quality in the area. They say that the Army Corps of Engineers should never have granted permits for its construction. The pipeline would carry crude oil from North Dakota’s Bakken Shale formation to Illinois. Its supporters claim it will be spill-proof, and that its construction will generate thousands of jobs. Critics respond that any leak would poison the Missouri River, which borders the entire western edge of the Standing Rock reservation. Despite its appalling human rights record, Saudi Arabia was awarded a seat on the U.N. Human Rights Council last year and this summer was selected to oversee an influential committee within the council that appoints officials to report on country-specific and thematic human rights challenges. Unsurprisingly, Saudi Arabia has used its newfound power to thwart an international inquiry into allegations that it committed war crimes in Yemen. It’s not by happenstance that the kingdom announced the mass execution just days after 130 people were killed in Paris in the worst terrorist attacks in Europe in more than a decade. Even before Paris, the U.S. used its “war on terrorism” to invade and occupy Afghanistan and Iraq, engage in mass surveillance and develop an assassination program immune from judicial oversight. Is it any surprise that Saudi Arabia feels emboldened to intensify its own “war on terrorism”? The aim of the labor movement is a society where all people are equal. All should have equal rights and obligations irrespective of their gender or sexual orientation. The legal requirement to live in compliance with a certain gender role is not justified in the light of modern understanding of gender and therefore legislation needs to be updated to meet people’s identities. The Nordic Youth Council has proposed the recognition of a third gender in the entire Nordic region. The terms of gender recognition are of crucial importance for the realization of human rights of transgender people. Saudi Star Agricultural Development plans to pump $100 million into a rice export project in Gambella region of Ethiopia despite allegations of human rights violations surrounding the “villagization” program under which the land has been taken from indigenous Anuak pastoralists to lease to foreign investors. The company is owned by Mohamed al-Amoudi, who was born in Ethiopia to a Saudi father and an Ethiopian mother. Al-Amoudi made a fortune from construction contracts to build Saudi Arabia’s national underground oil storage complex. Now a billionaire many times over, al-Amoudi has invested heavily in Ethiopia where he owns a gold mine and a majority stake in the national oil company. Al-Amoudi was one of the first to invest in a new scheme under which president Meles Zenawi offered to lease four million hectares of agricultural land to foreign investors and his company was also one of the first to become the subject of controversy. After Saudi Star was awarded a 10,000 hectare (24,700 acres) lease in 2008, a dozen aggrieved Anuak villagers attacked Saudi Star’s compound in Gambella in 2010 and killed several employees. Saudi Star abandoned work at the time but this past November the company announced that it would return to invest millions to grow rice using new large-scale flood irrigation techniques. Saudi Star hopes to sell its produce to Saudi Arabia under King Abdullah’s Food Security Program. But activists say that Saudi Star’s newly invigorated project in Gambella is likely to have a detrimental impact on the local population, notably pastoralist groups like the Anuak as well as the Nuer. “Sadly, right now, the Anuak, nearly all small subsistence farmers, are becoming refugees in their own land as they are internally displaced from indigenous land their ancestors have possessed for centuries,” Obang Metho, Executive Director of Solidarity Movement for a New Ethiopia, told the Africa Congress on Effective Cooperation for a Green Africa. “They have become ‘discardable’ by a regime that wants their land, but not for them, in order to lease it to foreigners and regime-cronies for commercial farms,” he added. All told as many as 1.5 million subsistence farmers are expected to be offered voluntary relocation to new settlements where the government has told them that they will be given housing, social services and support infrastructure under the villagization program. However, activists like Human Rights Watch and the Oakland Institute say that the relocation process has been plagued by violence and broken promises. 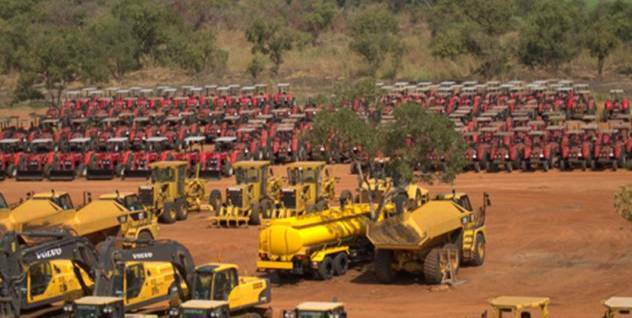 Saudi Star caterpillars, tractors, bulldozers, trucks and other heavy equipment parked near a 10,000 hectare plot of Indigenous land. Instead of getting housing, villagers are forced to build their own tukols – traditional huts – and risk beatings if they speak out, says Human Rights Watch, which conducted interviews of 100 residents during the first round of villagization that occurred in 2010. The majority of resettlements did not have a school, health clinic or even water wells, says the Oakland Institute. Lack of agricultural assistance such as seeds, fertilizers, tools and trainings, have further exacerbated the risk of hunger and starvation among families.